Predictions were calling this a coronation more than an election. It was considered a slam-dunk, an election was not really necessary but democracy required going through the motions. “a rather modest 2% swing directly from Labour to the Conservatives, therefore, gives Mrs May an extra lift, resulting in 420 seats and a 190 majority”. Yesterday, Thrasher is in more somber mood, this time making no predictions. The time between Threshers Sky News analysis then and now has been, lets’s say ‘testing’ for Theresa May. Truthfully, she has shown what type of leader she would in fact be in the choppy waters of Brexit Britain. Not that good. And not that stable either. One should not forget that it was a ‘reckless and futile’ attempt to quieten Brexteer MP’s once and for all by David Cameron that has led to the chaotic situation the country finds itself in. Not only is Britain now facing a fight with 27 nations just across the channel with the Tories happy with a ‘good deal or no deal’ scenario, but also one on our doorstep with Independence for Scotland looking ever more likely. Then that YouGov poll suddenly turns up with the results of a ‘Shock Poll’ predicting for the first time that we are now in hung parliament territory. The YouGov poll predicts that no one political party would secure enough seats in the 650-seat House of Commons where 326 seats are required to form a government. It predicts the Conservatives would win 310 seats, down from 330 now. But before you run down to the bookies and bet your wages on a hung parliament, there’s a problem with that poll. At their own admission, YouGov were, for the first time using a new and controversial polling model, which by their own admission was what they termed – ‘brave’. And this change of modelling was only deployed for the first time – just 10 days before a crucial election. To all intents and purposes this is not an opinion poll in the usual sense but a seat by seat “estimate” projected into a national result. BritainElects is a poll aggregation service that aims to deliver non-partisan analysis of the state of public opinion – a ‘poll of all polls’ if you like. On April 6th they had the Tory lead at an unassailable 16 points. One month later on May 6th, BritainElects reports the Tory lead had increased to 18 points. 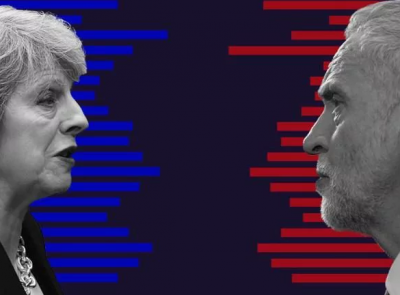 This contradicts the usual pollsters who by now are predicting that Theresa May’s commanding lead has crested and Corbyn’s slide arrested – what ever next. By May 31st that unassailable lead has dramatically declined by 8 points in just three weeks. The lag in collecting data from each poll is now showing a marked trend and could well be shy of real voter intentions. As for the recent ‘brave’ YouGov result, there’s a real sting in the tail. As we know now, polling has had a mixed record in the U.K. and elsewhere in recent times. YouGov had predicted that Scotland would leave the U.K. in its 2014 independence referendum, which of course, it didn’t; that Labour and the Conservatives would be a dead heat ahead of the 2015 general election, which the Conservatives won; and that Brexit would be a close call where Leave won on a margin of 1.2 million votes at 52-48. And the sting? YouGov’s chief scientist, said the new model, whose data was not published at the time, showed ‘Leave’ winning easily, which it did – and no-one in the main-stream pollsters were saying that. The same modelling that correctly predicted Brexit and did so with some accuracy is being used in this election. So, with on week to go, will be it be the election that Theresa May lost or the stunning win that a resurgent left grabbed at a crucial moment in Britain’s history? There’s one final thought that should not be overlooked. That of how the Brexit vote was rigged by billionaires in the first place. It is here that democracy is threatened the most. In my article entitled “The Link Between Brexit And The US Election, MI6, Fake News And Dark Money” I broke the story to Britain weeks ahead of The Guardian article that confirmed my worst fears. American billionaires had colluded with LEAVE campaigners who had themselves illegally joined up with competing parties to push an unsuspecting electorate over the line with a massive military strategy utilising personal data sold by social media organisations. In BREXIT: Proof That Britain’s EU Referendum Was Rigged the accusation is made that we in Britain have just made the first step into a brave, new, increasingly undemocratic world controlled not by government, but by the founders of new transnational corporations whose world view takes no consideration of democratic principles.